Small Group Activity is known as focused or continuous improvement. SGA is a method for problem solving in teams by structurally searching for the root causes and eliminating them. After standardization of the solution, the reoccurrence of the problem is prevented. The feeling of ownership is intensified because those who are directly involved solve the problem in a multifunctional team. Because of the holistic approach of SGA in supporting ground level energy efficiency improvements on a continuous basis, KEP, which is a joint initiative of BEE & IIP, is supporting industry in organizing and implementing SGA at plant level. The support for SGA is being provided by KEP as a value added service under the SPARC model. Small Group Activity for JK Lakshmi Plant, Durg started with an opening session by Shri K K Chakarvarti, Expert Consultant. 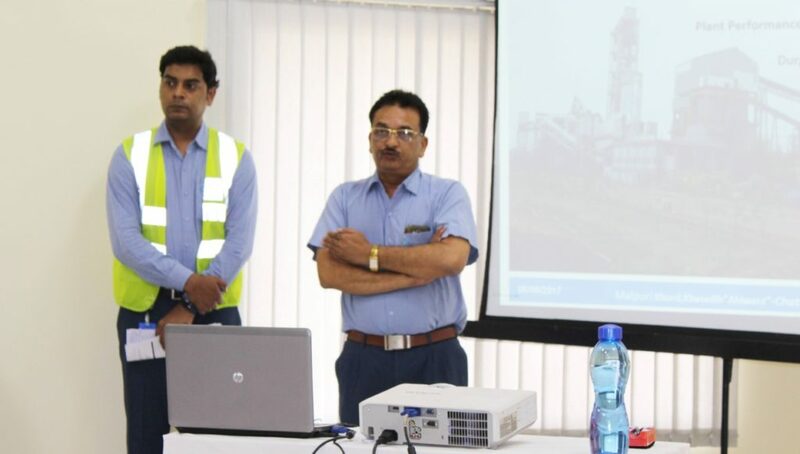 Explaining the background of SGA, Shri Chakarvarti highlighted that SGA has tremendous potential in helping a plant realize its productivity and efficiency target, the onus of its success was with the employees at the operational level. He emphasized that the SGA needs to work as a team and identify innovative approaches through change in practice, technology, approaches to enhance the efficiency of the plant in their area of operation, reduce energy use and minimize wastage. He clarified that in doing SGA, the burden of employees doesn’t increase but infact helps them in improving their productivity, boosting their knowledge and confidence, team building and communication. Each group comprised of 3-5 engineers. The engineers working in various departments viz. Instrumentation, Electrical, Production, Mechanical and Quality control were part of these groups. This session was attended by plant top management, including Shri Mukul Shrivastava, Vice President (Engineering) and various Plant Heads. Shri Chakarvarti gave a brief introduction of the SGA and groups formed. He informed the plant management that SGA has resulted in great enthusiasm among the group members and to find out the solutions and steps to achieve energy efficiency development. In total 310 kW power saving target has been planned by 5 Groups. The plant engineers must increase the horizon to increase the power saving potential and should consider other areas as well. In order to further strengthen the efforts, the Mechanical department will also extend all the support to the groups. All the groups to dedicatedly work to achieve the planned targets. In the Concluding Session, Shri Mukul Srivastava, Vice President (Engineering), congratulated all the group members in undertaking the energy saving targets. He felt that these types of programs organized by KEP will help in developing leadership quality in our young engineers. Capacity building exercise and SGA provided the Durg plant a great opportunity, which was visible from the energy saving opportunities identified by the participants. Shri Srivastava also thanked the support provided by Shri S. K. Wali, Whole Time Director, JK Lakshmi Cement in giving this opportunity to participate in KEP’s Capacity Building Programme and Small Group Activities. He also thanked the KEP’s faculties in making both events successful. The SGA’s will now prepare a detailed action plan for implementing the projects identified by their groups, the progress of which will be reviewed by the Management of JK Lakshmi Cement and KEP at the end of 2 months. After this mid-term assessment, the final assessment will be carried out by the plant at the end of the implementation period to evaluate the relative performance of each group in terms of achieving their objects and energy saving targets proposed by them. To encourage the team members, JK Lakshmi Cement Limited may also institute a reward system to recognize the best achievers. The workshop was concluded with a feedback session where the participants were requested to provide their inputs/suggestion for improving and enhancing the effectiveness of such small group activities organized at plant level. 80 % respondents mentioned that this program enhanced their critical thinking, oral communication, leadership skills, team and self- management along with an increase in understanding of diverse perspective while working as a team. 72% respondents felt that this training program helped in learn about one or more specific ideas that they will be able to implement in the area of energy efficiency and new approaches to energy management. The SGAs can go along with in improving the technical and operational efficiency of the plant which in the long run can will not just help the plant meet its’ regulatory environment and standards but also increase the productivity and profitability of the organization.